Sonic celebrates Presidents' Day by offering $1 hot dogs all day today, February 19, 2018, at participating locations. The discount is good on both 6" All-American Hot Dogs and Chili Cheese Coneys. There's a limit of five discounted hot dogs per order, while supplies last. 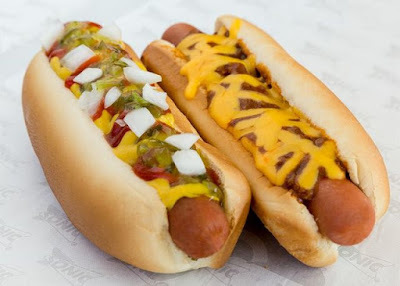 The All-American Dog comes topped with ketchup, yellow mustard, relish, and chopped onions while the Chili Cheese Coney includes chili and shredded cheddar cheese on top. Both regularly sell for $1.99 or so.